This page was done on 9-24-12. 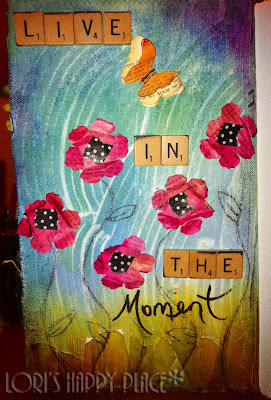 We had football practice that night, book club, and then my online LIVE class with Tracy Weinzapfel. So much fun, as always, but needless to say, I was so busy that night, I forgot to take a picture of the page and post it. Here is Page 4 of my canvas Art Journal that I have been painting along with Tracy and some great friends every Monday night. Love my Monday nights and all these wonderful friends. And here is a link to the recording of the LIVE Ustream of Tracy Weinzapfel from the 9-24-12 broadcast. It was Mary's reaction to finding out from the angel what was going to happen in her life. It showed EXTREME faith that no matter how odd things may have seemed to her, she trusted that God was in control and had her best at heart. 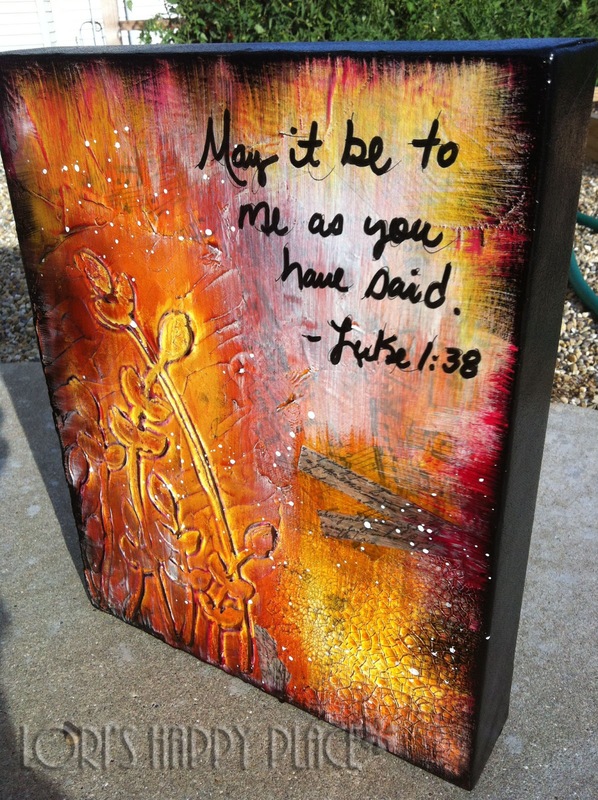 I immediately knew that I wanted to paint something with that verse on it. 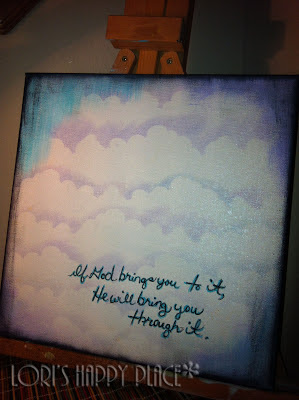 I want to always remember that He is in control of my life and he knows what is best at ALL times. I pray that no matter what happens in my life, that I remember this verse and have the faith to know it in my heart, like Mary. Here are some pictures of the canvas I made. It took me all week to finish, but it turned out exactly how it looked in my head. Absolutely, the coolest thing that God has ever helped me paint. Ok, not really! But, it is catch up day!! A friend of mine posted that as their Facebook status. I just laughed, because that is exactly what it is around here today. We had a busy weekend of running around, and now that I have the house to myself, it is time to get some stuff done. I currently have not 1, not 2, but 6 canvases laying around drying and it is only 10:30 am. LOL. No, I did not paint them all today. Some have been finally sprayed with fixative and are drying. Some have been modified with the last of my modeling paste and are drying, and some just had a bunch of stuff glued to them and are drying. 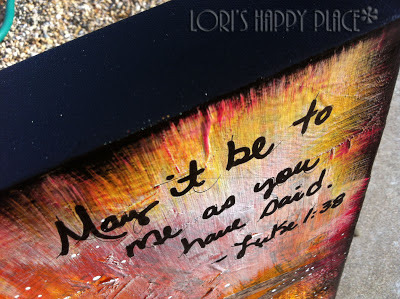 While I wait, I am listening to a local radio station, balancing the checkbook, paying bills, cleaning, posting on the blog, checking facebook, and trying to figure out my new Etsy store. See ya around, time to move on to the next project. Hugs, Love, and blessings to you all. 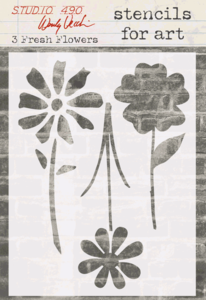 I used my brand new Wendy Vecchi Stencil For Art "3 Fresh Flowers". The flowers were stamped onto the canvas using the stencil and and my embossing ink pad. 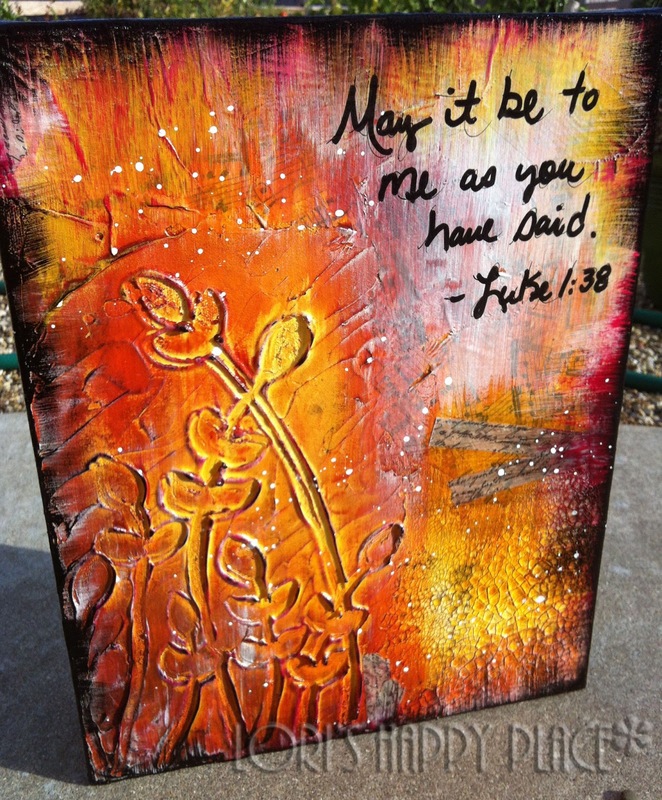 I then sprinkled Ranger's Melt Art Ultra Thick Embossing Enamel in White and heat set the flowers. I painted the flowers with Copic Markers over the embossed white. 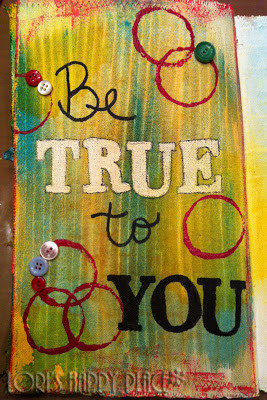 The sentiment was written with a Signo Uni-ball White pen and the bottom piece is just a strip of dry wall mesh. The final step was to spray the whole thing with a mat fixative. Had so much fun hanging out and laughing with some really good friends. The highlight of the week, like always!! Will add the link to the recording of Tracy painting once she gets it posted. Boo!! Boo!! Boo!! Boo!! Boo, to you!! Happy Halloween!!! Ok, I just LOVE Halloween. This month, I was asked to work with Echo Park's Chillingsworth line for my In House Design Team samples for The Scrapbooking Studio in Bloomington, IL. I absolutely adore Halloween, so this was EASY!!! Echo Park knocked it out of the Park with this Chillingsworth line. I LOVE absolutely every little piece of it. I even bought more paper packs to do additional projects above and beyond my store samples. So much Chilly Halloween Fun!!!! 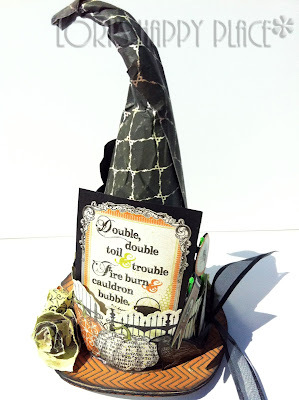 The first item I made was this amazing Grunge Witch's Hat. I wanted it to look warn, and old, like it was warn by one of those ancient scary looking witches. I did not want it to look like a hat warn by someone in a picture perfect costume. It turned out perfect. I love it!!! The next item I designed was a Dancing Candelabra Frame. This is a favorite picture of mine. My eldest Son is playing the organ outside Haunted Mansion at Magic Kingdom in Disney World. Since he took six years of piano lessons, I take every chance I can get to put those fingers to keys. He humored me, but only a little. LOL. 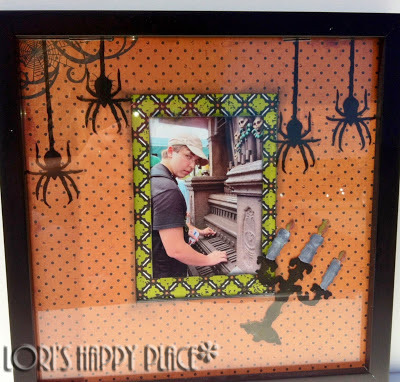 The picture is matted with two different pieces of the Echo Park Chillingsworth line and then I used my Vagabond and my Tim Holtz Candlelight Fright Die to decorate the frame. settings and could not get the glare to stay away. Then I made a layout using some more pictures from The Haunted Mansion. One of the pictures is the Mansion itself, and the other is m youngest son taking a break around the corner from the ride after we rode. I ripped the Echo Park Chillingsworth paper in this layout to make it look a little more old, like the items you see inside the ride. The "Do you believe in magic?" 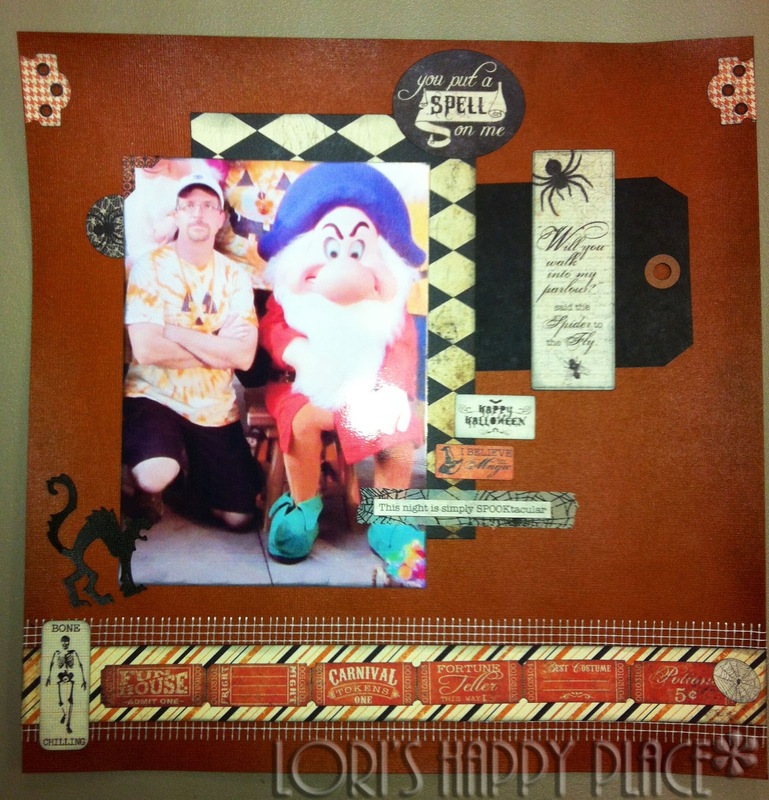 journal box reminded me of Disney magic. Such a great page to showcase a great trip to my Happy Place!! 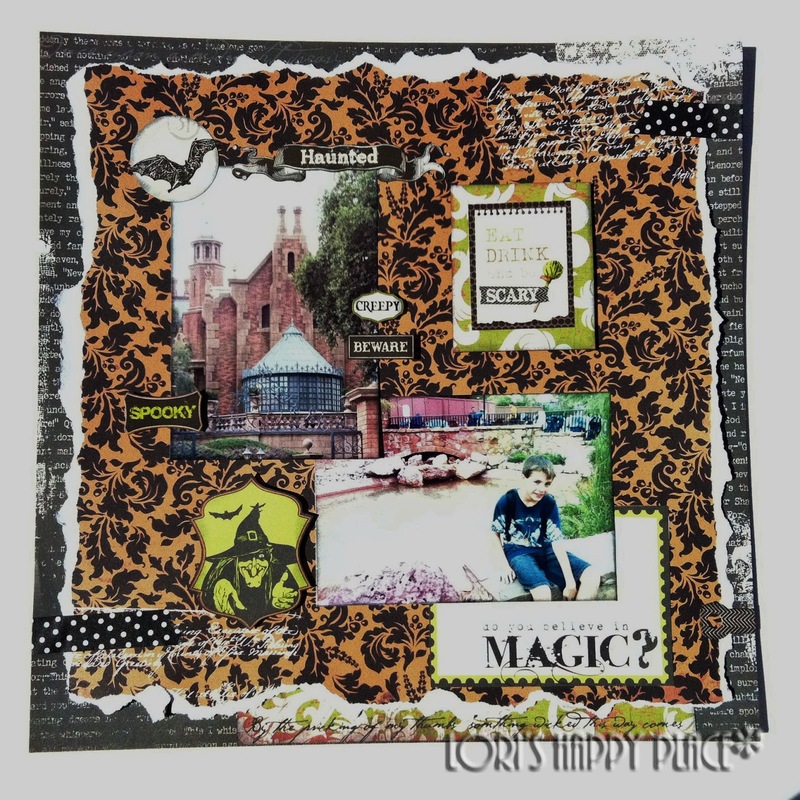 The final item I made, was a simple Halloween Card using some of the stickers and a journal frame from the Echo Park Chillingsworth line. A fun and easy way to wish someone a Spooktacular Halloween!!!! So much CHILLY fun using the Chillingsworth line. Absolutely LOVE it!!! Can not wait to see what else I can make with this Bootiful line from Echo Park. 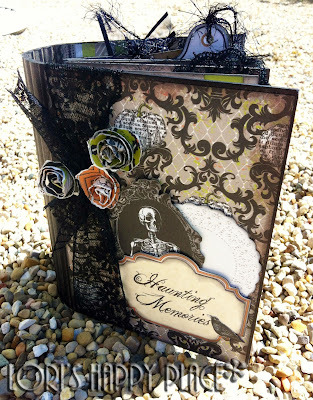 I also will be teaching a Chillingsworth Mini Album class on October 21st, 2012 at The Scrapbooking Studio. 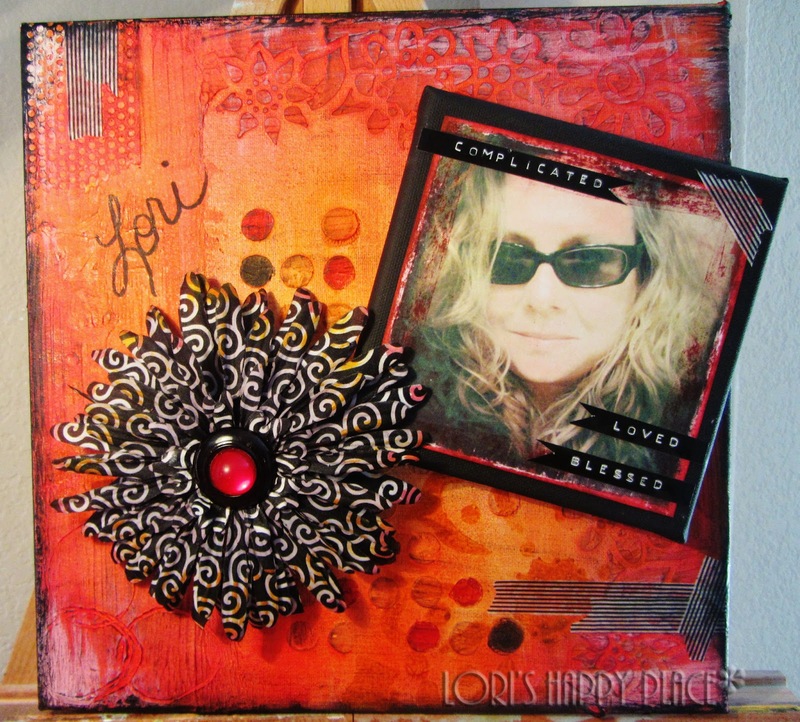 This fabulous album was designed by Pinecone Press. 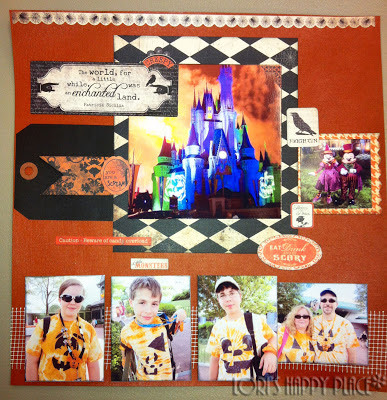 One of my BFF's Jen is on the Clear Scraps Design Team. 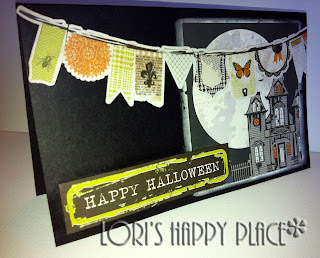 Just sharing her blog post on how to do a Teacher card using Clear Scraps parts. Way to go, Jen!!!! You did an amazing job!! This past Monday, we did our first page. We had an absolute blast painting along with Tracy Weinzapfel. I laughed so hard I nearly cried when Tracy's Ustream chat restarted to the beginning and she could not see that we were responding to her. She thought we all left. Luckily her mom figured it out and rescued her with a text message. We will be working in this in September! Newbies are always welcomed warmly!!! First up is a 12x12 Canvas with a fun Halloween quote. 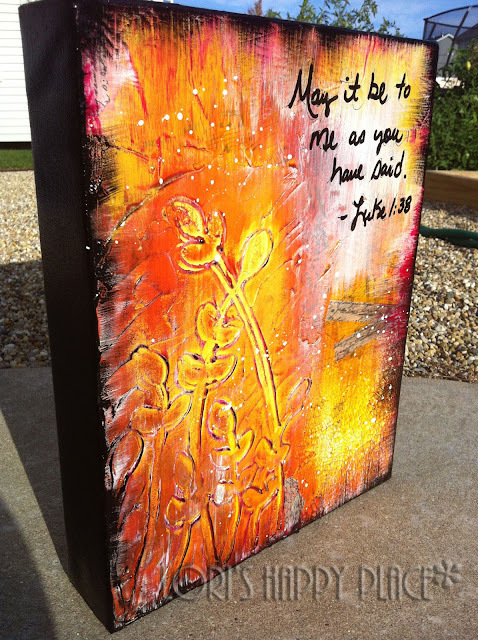 Paint top of entire canvas with Claudine Hellmuth Black Gesso. 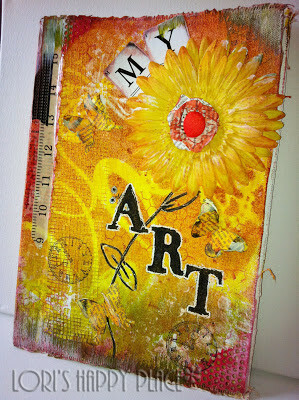 While you are painting - slip some torn pieces of Tim Holtz Tissue Paper into the mix. 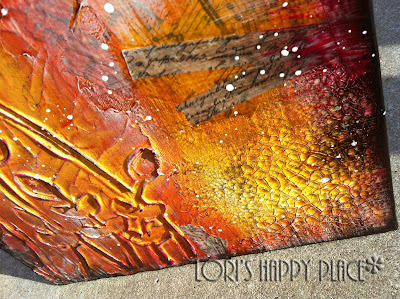 When the paint dries, there will be great texture from the tissue paper. 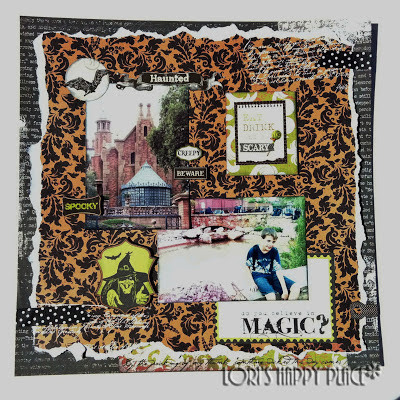 Use the Tim Holt Pumpkin Jack die and your Vagabond to cut out a pumpkin using the Authentique Enchanted "Haunted" paper. The stem cuts with the pumpkin. The stem is just the flip side of the pumpkin paper. Ink edges of pumpkin with Tim Holtz Ripe Persimmon Distress Ink. 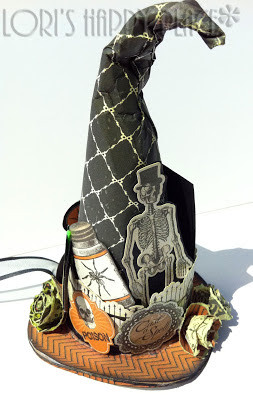 Ink stem with Tim Holtz Mowed Lawn Distress Ink. Heat emboss top of pumpkin using Tim Holtz Distress Embossing Ink and UTEE. 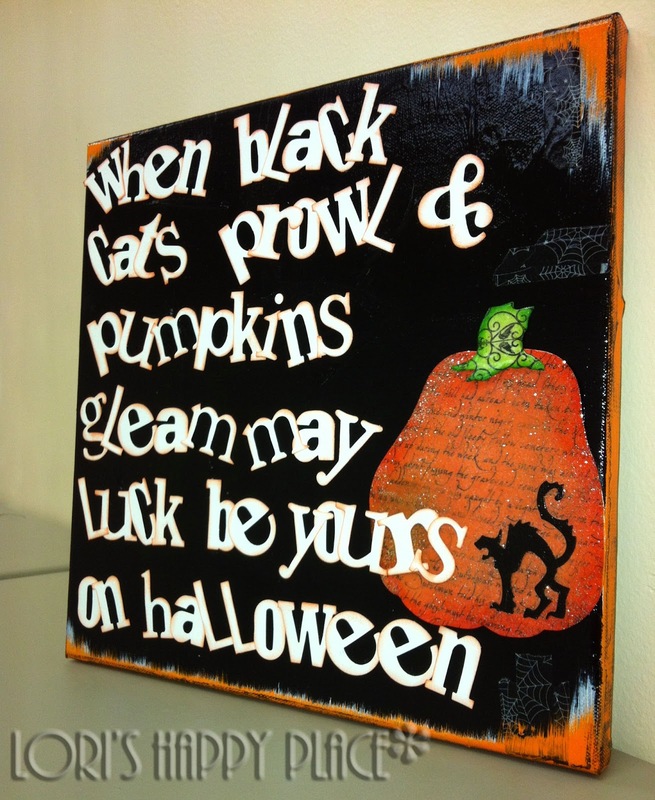 While it is melted, but still liquid and HOT, sprink a little glitter on pumpkin. Let cool. 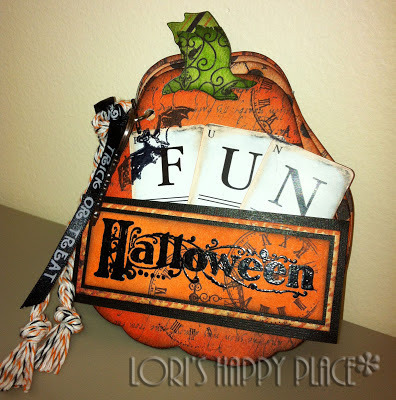 Cut out all letters in white cardstock using Tim Holtz Word Play Die. Ink edges of letters with Ripe Persimmon. 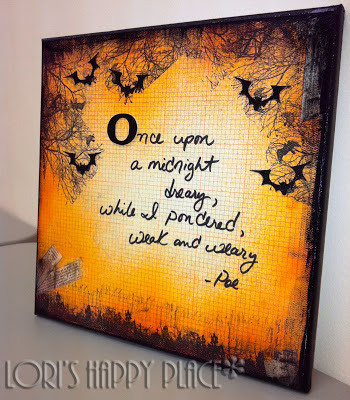 Adhere some Halloween Washi tape to the edge of the canvas in three places. Distress edges of black canvas with White Gesso. Paint edge of 12x12 canvas with Golden's Acrylic Cadmium Orange. 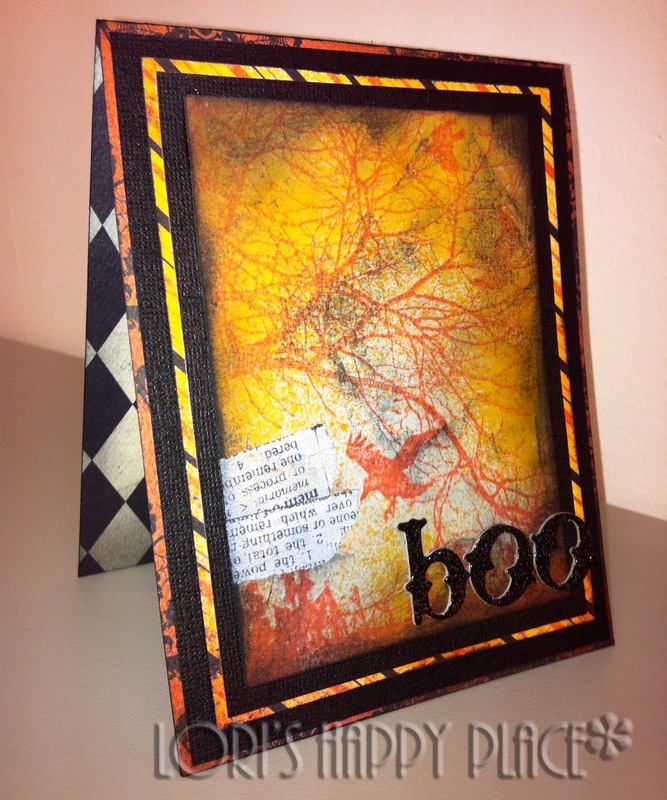 Add more to top to distress edges like the white gesso. Use Helmar's 450 Quick Dry to adhere Pumpkin, Cat, and quote to canvas. Spray entire canvas Clear Acrylic to protect it. I also made the following items, but do not have detailed instructions for each of them. They all use the wonderful Authentique Enchanted line. 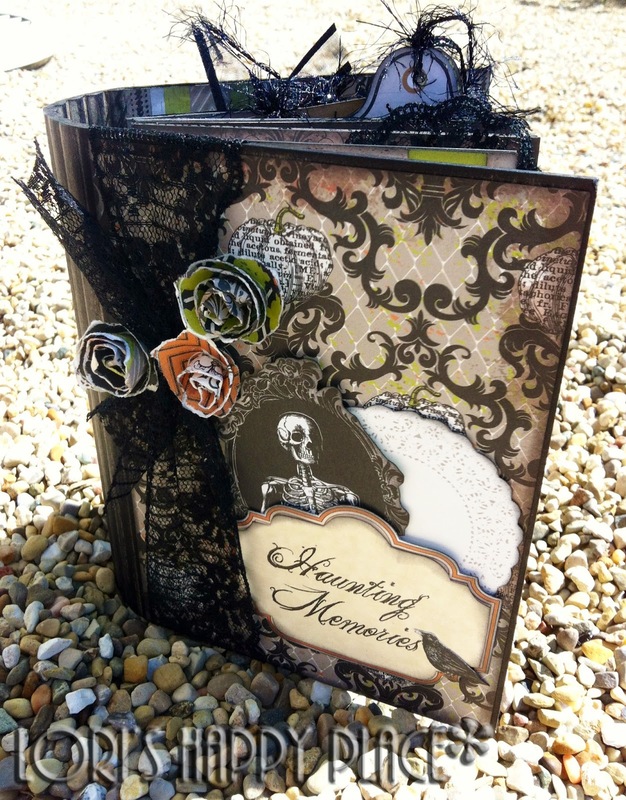 I hope these items inspire you to make your own Bootiful Halloween items using the Authentique Enchanted line. 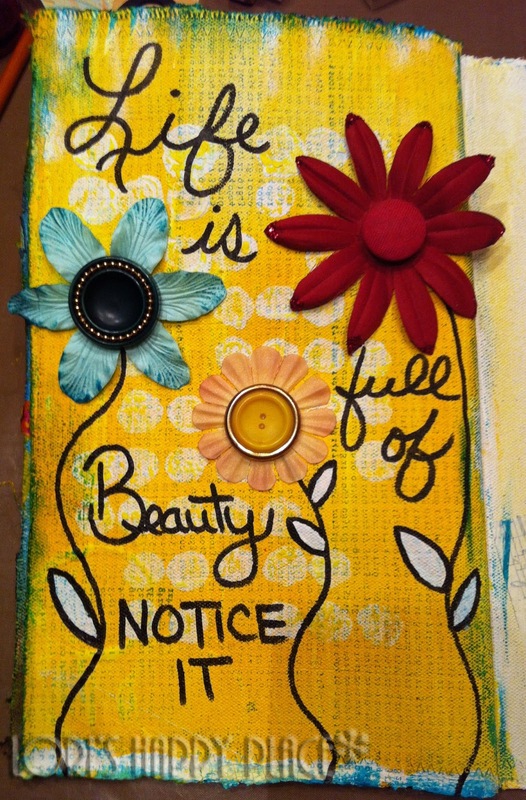 All samples are displayed at The Scrapbooking Studio in Bloomington, IL. And I mean that literally!!! No, I do not have the Halloween pictures edited yet. Will have to do later this weekend. Today, at 9:30 am, I got a text from a friend that 10 cop cars were seen speeding toward the local high school. The same school where TWO of my kids attend. The rumor was there was a gun in the building. To say I freaked out would be an understatement. I basically came unglued. I have never been more scared in my life. I ran from my laptop to the tv to the desk computer trying to find something that would give me news coverage. I found nothing. I knew that for many years the school had implemented drills to evacuate the kids in emergency situations to OUR church in the field next to the school. I raced, in a thunderstorm, out of the house to get to the church. I left every light on in the house, doors unlocked, and windows slightly open. I was scared to death. Luckily, the student was apprehended by a rookie teacher that tackled him and kept him down until police arrived. Three shots were shot into the ceiling, but no one was hurt. That is where the thank you God comes from. After the events of today, I needed something to try and calm my shaky heart. I will not say that at every moment today, I remembered this quote, but I am trying to now. I went into my crafting area and painted it as a reminder. Thank you God for keeping everyone safe. Please heal this young man and his parents heart. They need you now. Ok, instead of getting ready, I am here at the computer. Story of my life. Heading into The Scrapbooking Studio in Bloomington, IL today. Not scheduled to work. I just have to cut for a class that is tonight, finish some store samples, and take some pictures. LOL. That looks like more to do when it's typed out. Oh well, hanging out at the studio is always fun, so no stress. Will post pictures of my Authentique "Enchanted" Halloween store samples tonight or in the morning. Stay tuned!! So very excited to announce that I have been asked to be the October Mystery Kit Design Team Member for Home and Garden Welcome. If you have never heard of them, them please check them out. I will be receiving my kit in September and then it is hush hush!! LOL. Not allowed to reveal the contents. 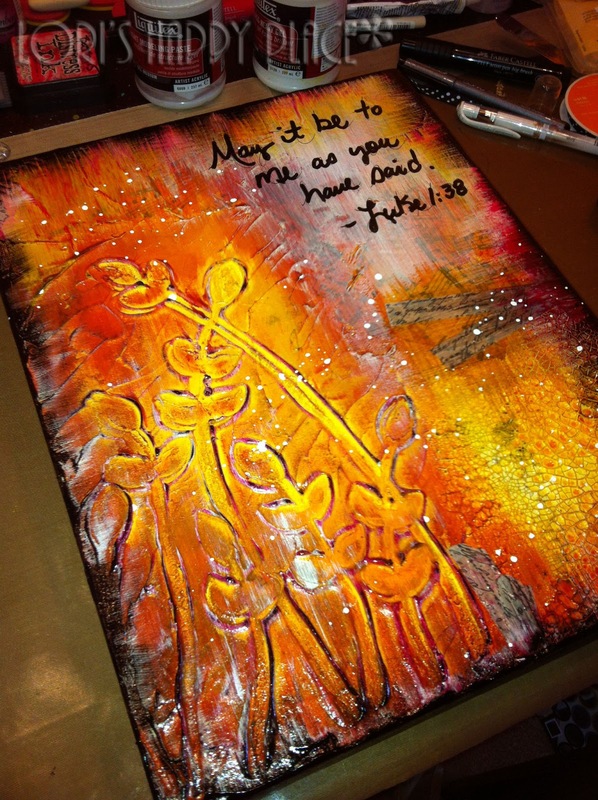 I will design in October and then my designs will be shared by me, and Nikki, the first part of November. Please consider buying a kit and we can compare what wonderful and different things we come up with. Check out the link below to see how you can submit what you make and maybe win some free product. Woohoo!! On most Monday nights, you will find me hanging out at home watching Ustream, and sometimes designing, along with Tracy Weinzapfel. Absolutely, positively, LOVE this girl. She is a never ending inspiration in both life and art. Each month, Tracy challenges us to design something. This past month was just WRONG!!!!! She told us to design something that included a picture of ourselves. Ok, what did she say? Is she kidding me? Ugh. She could have asked me to paint with blood and beet juice, and I would not have blinked, but a picture of myself? UGH!!!! No way!!!! I hate getting my picture taken. I am the picture taker, not the subject. The words - "No way!! I can't do it!!!" immediately popped into my head. Plus "Are you flippin kidding me?" I thought she was completely out of her mind!! Well, she was not kidding. So, because I never back down from a challenge, I did it. Yes, it hurt!!! Yes, it was completely against everything I thought I believed. BUT, I did it, and it turned out better than I could EVER have expected. 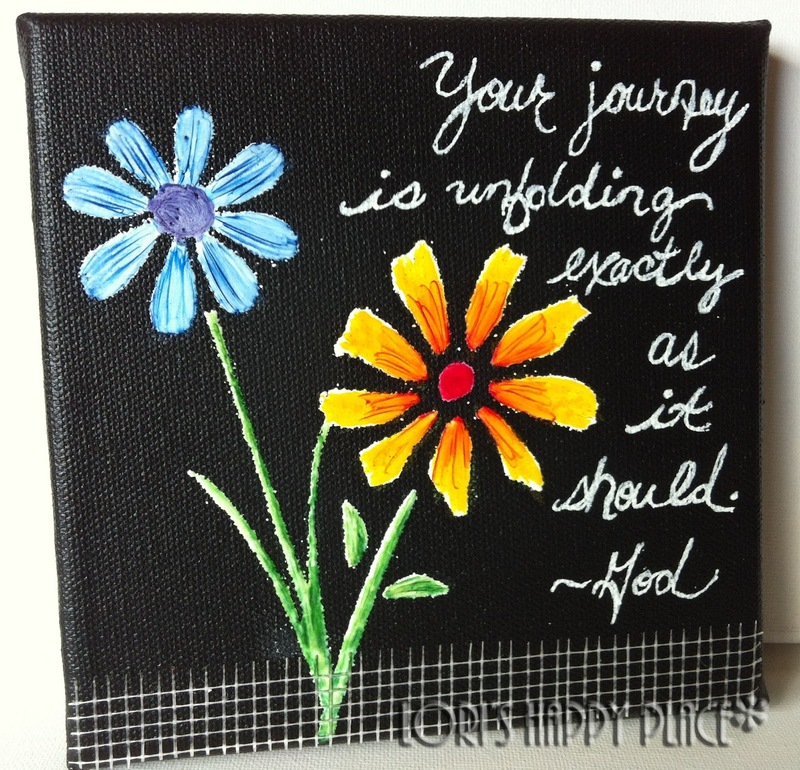 The final project after a little more washi tape and adhering the small black canvas and flower to the bigger canvas. It actually turned out wonderful. Ok, I did it!! Tracy said - I Dare you, and I did. I can actually say that her telling me to do a project with my own picture was beyond scary to me. Yes, she could have probably asked me to do ANYTHING, and it would have not been more out of my comfort zone. I don't like pictures of myself!!! But, I made a promise to myself that I would no longer live in my comfort zone. It was time to stretch my bounderies and see what is possible. I am in tears. If someone would have told me a month ago, I would do a project about myself, and even like it, I would have called them crazy. Nuts even!!! But, the fact is, I more than like what I did, I LOVE it!!! It is by far the coolest thing I have ever done. I was in the ZONE. I kept thinking of new things to do and I just did them. I didn't second guess myself or over think things. It was absolutely, 100%, a life altering project. Some people may think I am crazy, but my biggest fear, myself, was set before me, and I WON!!! 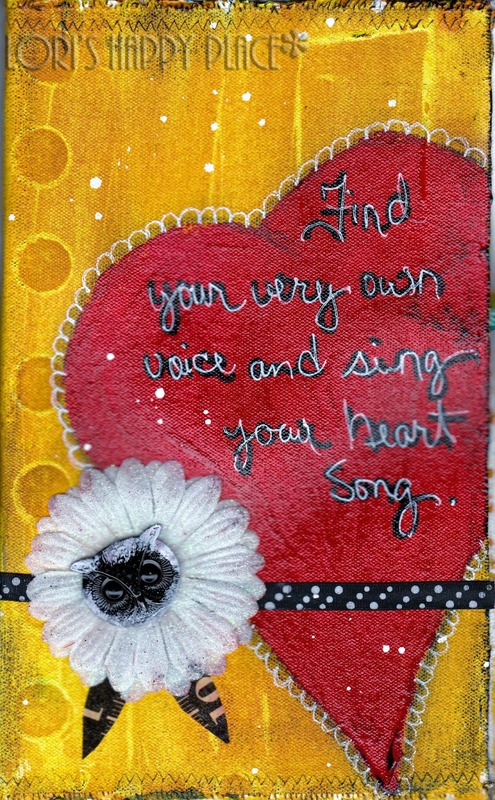 Always remember - to stretch your boundaries and let your heart live outside it's comfort zone. You might just find - You like it out there! Ok, my life is hectic. Whose isn't right? Well, for the last year, I have crafted out of two rooms. One is in my "Formal dining room" (That we do not use for that. ), and the other is in my beautifully half done craft room that my husband and I have been doing ourselves. It currently has 4 beautifully studded walls, but HORRIBLE lighting. That means my storage is downstairs in the basement, but I craft upstairs where there is better lighting. Here are my wonderful Faber-Castell Gelatos. Up until recently, they lived in a red solo cup. How sad is that?? Or how about these Water Color Crayons that I ordered online. The were delivered a MONTH ago. They are still taped to the packaging they were sent in, because I could not figure out where to store them. I didn't need more solo cups on my desk. The gelato one already falls over and spills gelatos everywhere. I also knew that if I used a baggie, the crayons would break. Ugh. What is a girl to do? The gelatos no longer roll off the table and across the floor. The crayons have been untaped, and have a home. My colored sharpie markers also fit in one. I even had a container for some Tim Holtz Distress markers and some small tubes of Golden thick acrylic that is always getting in my way. Even my youngest son thought they were fabulous. He thinks I should empy mine and use them to organize his pencil/crayon drawer in the kitchen. NOT!!! They come in loads of fabulous colors, lid options and sizes. They will absolutely have the right container for any of your crafting or family needs. Ok, Hurricane Isaac finally arrived in the midwest. It rained here hard most of the day. I heard we got 3 1/2 inches so far. May not seem like a lot, but it only rained about 2 days all summer. We are not used to this much water. Because of the rain, I was indoors for most of the day. On Monday, I am starting a canvas journal class with some online friends. To prepare for this weekly class, I needed to gesso all the pages in the canvas journal. I would gesso two facing pages, and then wait till it was dry, and then repeat. 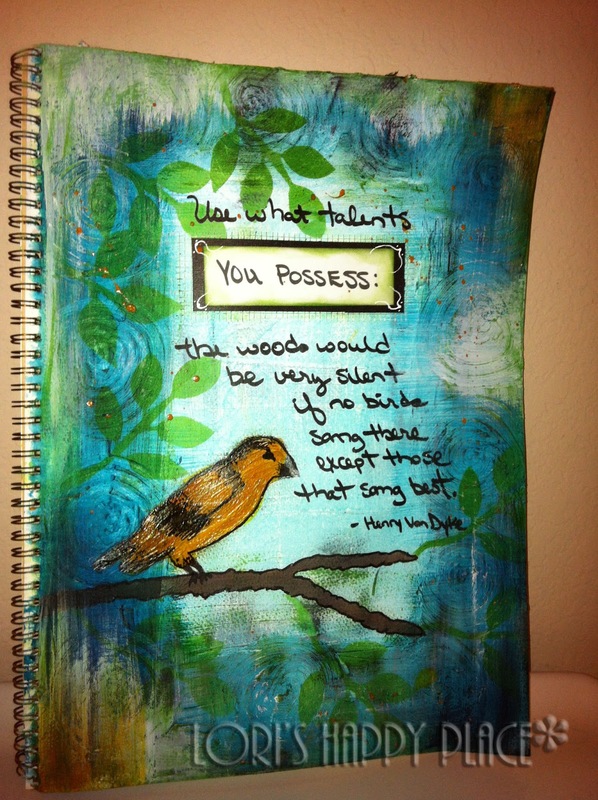 During the drying time, I painted in one of my art journals. I had a friend challenge me to paint a bird. Well, let's just say, this may be a one of a kind for me. (First and last. LOL) The poor bird ended up looking angry, though I love the background. So with a bunch of hooping and fanfare, I present to you "Angry Bird". LOL. Oh well, apparently grumpy birds need painted too. So funny!! !